July 25, 2017 “Information Clearing House” – The horrific execution by police of an Australian woman in her pajamas that took place last week in Minneapolis has again produced a torrent of criticism over killings initiated by law enforcement in situations in which the officers are in no way threatened. America has always been a violent place relative to much of the rest of the world, but even so there has been a noticeable shift in how, since the trauma of 9/11, some policemen believe themselves to be superior to and detached from the society they are supposed to be protecting. And the public is reciprocating, seeing the police frequently as a force that is no longer there to serve the people and instead something that should be feared. Even in the upper middle class predominantly white county that I live in, residents not infrequently discuss the increasingly visible and aggressive police presence. It is widely believed that arguing with cops or showing even the slightest attitude in contacts with them is done at one’s peril. The various levels of government that make up the United States seem to be preparing for some kind of insurrection, which may indeed be the case somewhere down the road if the frustrations of the public are not somehow dealt with. But there is another factor that has, in my opinion, become a key element in the militarization of the police in the United States. That would be the role of the security organs of the state of Israel in training American cops, a lucrative business that has developed since 9/11 and which inter aliagives the “students” a whole different perspective on the connection of the police with those who are being policed, making the relationship much more one of an occupier and the occupied. AIPAC has several pages in its website dedicated to security cooperation between the two countries. It asks “Did you know? In May 2010, 50 retired Generals and Admirals wrote to President Obama, highlighting the value of U.S. Israeli cooperation.” It goes on to cite an Alabama sheriff who enthuses that “There is no other country [Israel] that shares the same values and overarching goal to allow others to live in peace.” Regarding airport security, it also quotes a U.S. “security expert” who states “We should move even closer to an Israeli model where there’s more engagement with passengers…We’ve just stated to do that at TSA…” Indeed. That’s called profiling and pre-boarding interrogations. Even the federal government has gotten onto the Israel bandwagon, perhaps not a surprise given the number of Israel Firsters in Congress. In 2003, the Department of Homeland Security established a special Office of International Affairs to “institutionalize the relationship between Israeli and American security officials.” The New York City Police Department has a branch in Israel and carries out frequent exchanges. It should be noted from the git-go that Israel is no more knowledgeable about possible responses to acts of terror than is anyone else. The techniques employed to create physical barriers, to develop sources for intelligence gathering, and to train in tactical responses are quite familiar to anyone who has studied modern-style terrorism since it emerged in Western Europe in the 1970s. Most countries that have a high or even moderate risk level deriving from terrorists, either domestic or foreign, have recruited and trained special police and paramilitary forces that are familiar with the basic techniques and are quite capable of responding. Ironically, even though the United States government and local police forces have tended to look at the “real pro” Israelis for guidance, state of the art resources for learning about how to deal with terror are available right here at home. JSOC has teams that are every bit as effective – and lethal – as anything the Israelis can muster and the CIA and FBI together know far more about terrorists and how they behave than do the ideologically driven Mossad and Shin Beth. The American policemen who go on the “exchanges” are probably only dimly aware that what they are being shown is part of Israel’s military justice system, which has nothing to do with Israeli criminals, but instead is designed to keep the lid on the millions of Palestinians who live in what has become a virtual outdoor prison camp. It is an apartheid police state that uses deadly force as a form of crowd control. And the Palestinian former residents of the lands Israel now holds are the “terrorists” that Israel is protecting itself against. You can bet that the American guests for their part clearly do not realize that they are being trained as prison guards and you also can be sure that they never catch so much as a glimpse of the 300 child prisoners that Israel continues to hold without charges. Israel’s reputation for “dealing with” terrorism has in any event been glamorized by the Israel-friendly media and entertainment industry while also being promoted by Jewish organizations. It has meant in practical terms that many of the contract security firms operating at airports in the United States and Europe are Israeli. They have also infiltrated state Homeland Security agencies and corporate security in the U.S. Many of the Israeli companies with offices in the United States work closely with Mossad and might reasonably be considered arms of the Israeli government. Where Israel really excels is in its willingness to kill large numbers of Arabs of all ages and genders using the excuse that they are terrorists. It does so with impunity because Israeli courts almost never hold the army and police accountable for whatever they do. It might reasonably be suggested that when American police officers go through their training in Israel they acquire at least a bit of that attitude from their instructors. Recognizing that Israel is not exactly a model to be emulated when it comes to the human rights of its Palestinian victims, there is alternative viewpoint which suggests that American law enforcement might just be learning the wrong things when it travels to Israel. Amnesty International asks “With Whom are Many U.S. Police Departments Training? With Chronic Human Rights Violator Israel.” It notes that last August when the Department of Justice documented numerous violations by the Baltimore Police Department the report failed to mention that policemen from that city had received training in Israel. And actually, it is worse than that. The American visitors will be welcomed to contemplate the Potemkin village miracle of a democratic, multicultural, inclusive, clever Israel. They will not be allowed to see how the soldiers training them, representatives of “the most moral army in the world,” force Palestinian women to give birth at military checkpoints and watch their babies die, shoot Palestinian teenagers as they are running away for throwing stones, drag men and women out of their beds and kill them while terrorizing their children and dragging them off to jail during midnight raids. Amnesty’s article documents many of the abuses by Israeli security forces and concludes that using “Public or private funds spent to train our domestic police in Israel should concern all of us. Many of the abuses [in the U.S.] parallel violations by Israeli military, security and police officials.” I would also add that the training provided by JINSA, ADL and the AJC is also partly on the American taxpayers’ dime as the organizations are all tax exempt. Finally, Israel’s ability to market its state sponsored brutality has even become a form of light entertainment. A company in Israel called Caliber 3 that was set up by a reserve colonel in the Israeli army is offering what has been described as a two hour “boot camp” counter-terrorism experience. It includes a life size target consisting of a man in Arab attire holding a cell phone. The mostly Jewish American audience ponders if he should be shot, but the instructors eventually intervene and declare that he does not quite meet the standard for being killed. 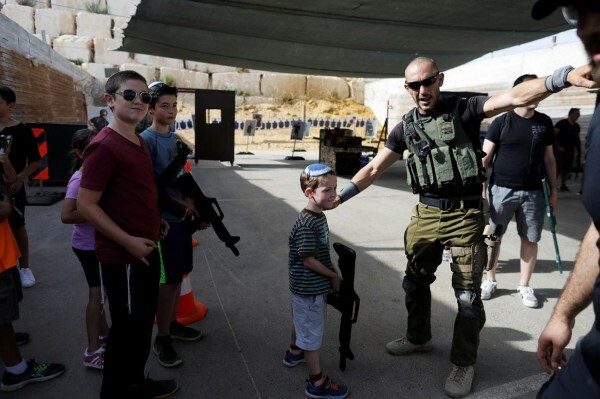 Visitors are also treated to simulations of Israeli commandos taking down terrorists and can even shoot live rounds from a semi-automatic weapon at a firing range. Ironically, the Caliber 3 gated compound camp is located in the Gush Etzion settlement bloc on the West Bank, land that was stolen from the Palestinians.